I'm going to gush because I don't possess the skill to organize words in a manner that will adequately laud this wonderful book. Everything about it was beautiful - the descriptions of the landscape made me feel like I was in the forest, or in the fields. The last time I read something that brought a setting to life like this was when I read Far From the Madding Crowd by Thomas Hardy. The principal characters were fascinating, and surprisingly I found them all likable, even the cantankerous, narrow-minded old coot, Garnett Walker! In fact, I was able to empathize with him the most, because he was so awkward around other people. In short, I loved this book. 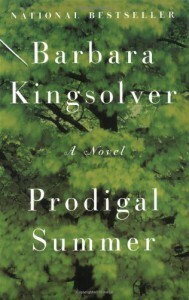 Ms. Kingsolver wrote a sequel to the Bean Trees (which I will be reading soon), and I wouldn't mind a follow up to this book some 5-10 years down the line to see what Deanna, Lusa, Nannie and Garnett make of the bounties brought forth by this one hot, prodigal summer.